Marc Jacobs' Election-themed West Village windows are pretty tame compared to what the designer has on display at his Melrose Avenue boutique. Racked LA has images of the windows, which are "set up with the Republicans menacingly on one side (with a particularly freaky look W) and brightly dressed Obama voters/supporters on the other. 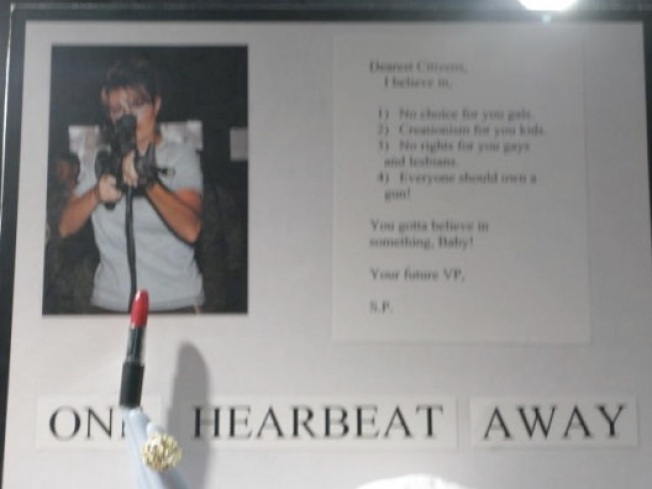 There's also a gun-toting Palin with a letter posted next to her image, which reads as follows: Dearest Citizens, I believe in, 1) No choice for you gals. 2) Creationism for you kids. 3) No rights for you gays and lesbians. 4) Everyone should own a gun! You gotta believe in something, baby!" No room for "You betcha" or "Team of mavericks," Marc?